The season to be jolly was upon us and what better way to ring in the festive cheer and countdown to Christmas than at the ‘Council for Business with Britain (CBB) Christmas Carols 2018’ held at the Westminster House under the patronage of British High Commissioner James Dauris and his wife Helen Dauris. Members and their families were extended a warm welcome by the British High Commissioner to his residence for an evening of readings and carols. CBB President Mark Prothero, delivering the vote of thanks, invited the guests to fellowship thereafter. The lighthearted evening was hosted by past Chairman of CBB Shirendra Lawrence. Invitees joined in ushering in the Christmas cheer singing traditional and contemporary Christmas carols accompanied by the 40 voices of the senior choir of The British School of Colombo, trained and passionately conducted by Shamistha De Silva Dean [Senior School Music Teacher of The British School in Colombo]. The true meaning and spirit of Christmas was experienced by all having listened to the specially curated Christmas readings by Prothero, Dauris, Dr. John Scarth (Principal, The British School of Colombo) and Roshanie Jayasundera Moraes (Vice Chairperson, CBB). The mouthwatering canapés and mulled wine were catered and sponsored by the Hilton Colombo Residences. 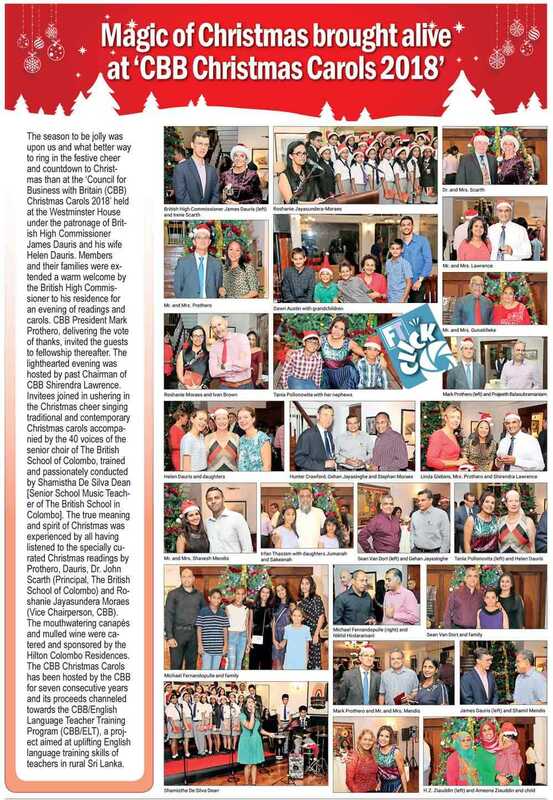 The CBB Christmas Carols has been hosted by the CBB for seven consecutive years and its proceeds channeled towards the CBB/English Language Teacher Training Program (CBB/ELT), a project aimed at uplifting English language training skills of teachers in rural Sri Lanka.